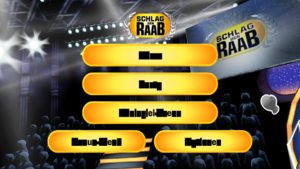 In Schlag den Raab you can get a taste of the original TV atmosphere and feel how you feel as a selected candidate in Germany's most popular TV show. 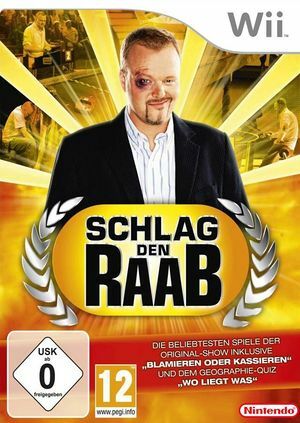 Compete against the all-rounder Stefan Raab and try to defend against his ambition and will to win. A game mix of skill, knowledge and action decides about victory or defeat. Put your general knowledge to the test in the popular "Shame or Cashier" quiz, test your geography skills in "Where's What", skillfully use the Wii Remote (Wii) for the "Pömpel Game" or compete with Raab in "milking cow"! Text is not readable if the Texture Cache Accuracy is set on Fast. Refer issue 10705. Texture Cache Accuracy set to Fast. The graph below charts the compatibility with Schlag den Raab since Dolphin's 2.0 release, listing revisions only where a compatibility change occurred.